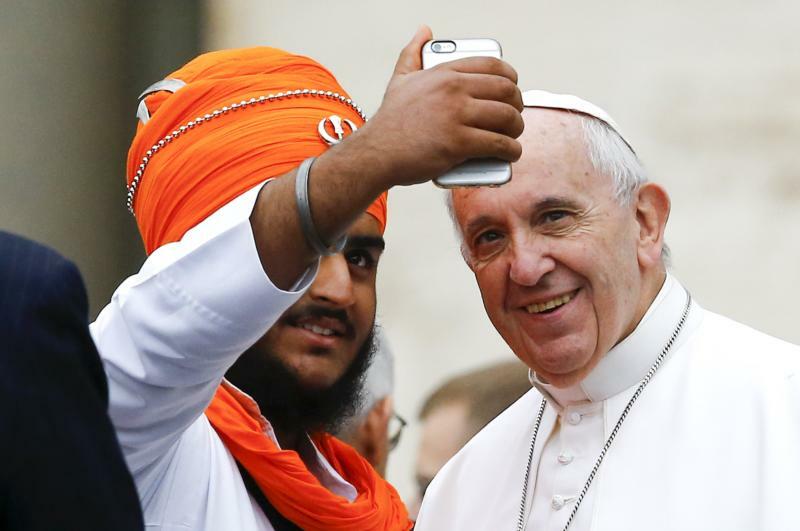 VATICAN CITY (CNS) — The world expects all people of religious faith to work with everyone for a better future, Pope Francis told representatives of major religions. “We can walk together taking care of each other and of creation” in joint projects that fight poverty, war and corruption and help people live in dignity, he told them during a special general audience dedicated to interreligious dialogue. The audience in St. Peter’s Square Oct. 28 marked the 50th anniversary of “Nostra Aetate,” the Second Vatican Council’s declaration on relations with other religions; the audience also recalled the historic first World Day of Prayer for Peace in Assisi, Italy, Oct. 27, 1986. The rain-soaked square was awash with color as thousands gathered under colorful umbrellas or plastic ponchos. Large groups of people came from other Christian communities and from other world religions and many held aloft olive branches. Representatives of many religious traditions sat in a VIP section near the pope and prayed in silence with him at the end of the audience. Concerning the future of interreligious dialogue, he said, “the first thing we have to do is pray. Without the Lord, nothing is possible; with him, everything becomes” possible. Pope Francis said respectful dialogue can lead to friendship and concrete initiatives between religious believers in serving the poor, the elderly, the marginalized and immigrants.